When you’re wearing your leggings to the gym or while you’re lounging on the couch, you might be thinking how nice it would be to feel the same comfort at work. If you can find the right ones, leggings can be the perfect professional attire. Not only are they comfier than most traditional work pants, leggings are usually less expensive, don’t typically require dry cleaning or ironing and can be worn with virtually anything. Fortunately, there are plenty of options for leggings that are work-appropriate and just as comfortable as your weekend or workout leggings. For office wear, the key is finding ones that are made of a fabric that’s thicker than your typical spandex leggings, so you don’t have to worry about them being see-through or making you look like you just came from yoga class. Some work-appropriate leggings go beyond the basic black style with seams, paneling, pockets, leather accents, zippers or prints. Whether you’re looking for leggings that look like regular pants or ones that will be comfy under a tunic or sweater, here are some professional-looking styles that work for all different sizes, tastes and budgets. 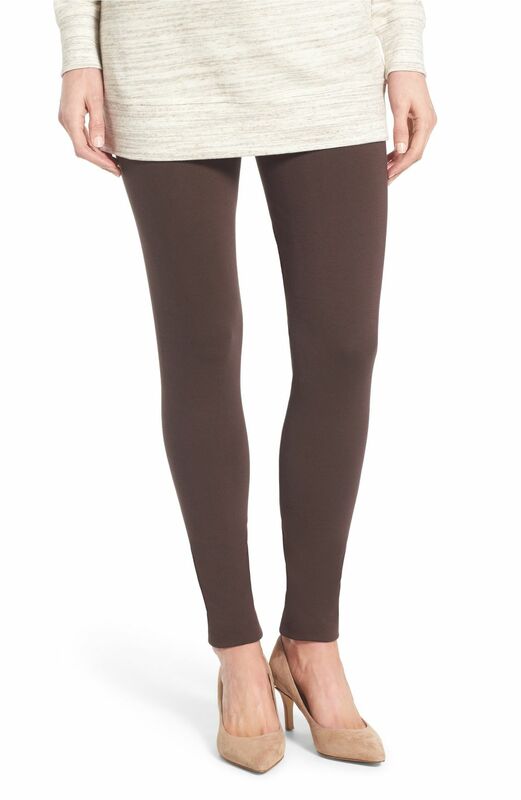 These versatile, stretch-knit leggings from Vince Camuto will quickly become your favorite go-to pants for the office, but they’re just as perfect for comfy weekend wear. Sleek and flattering, they feature a slenderizing back seam that runs from waist to hem. They’re thick, but can easily be worn for three seasons, so you’ll get plenty of use out of them. These stylish leggings are comfortable and stretchy, so they make great pants for traveling and can look dressy when paired with a nice top for a night out. They’re also machine-washable, so you won’t be adding to your weekly dry cleaning bills. Affordable and durable, these pants are available in regular or petite sizes and come in dark heather gray, espresso or rich black. They do tend to run a little large, so you may want to order a size down. If you’re looking for plus-size leggings that are comfortable yet professional-looking, these Sejour Seam Detail Crop Ponte leggings may be the ones for you. With raised seams that run down the front, these leggings are slimming and flattering on women of all ages and sizes. They’re cropped, so you won’t have the annoying problem of bunching at the bottom. They’re also high-waisted and thick enough that you don’t have to worry about your underwear being seen. You may end up liking these leggings so much that you’d wish they came in more colors other than just black. A quality pair of leggings is a great work wardrobe essential and with the affordable price of these ones from Target, you can stock up on this ultra-versatile style. They’re perfect for the office, but also look dressy enough for an after-work dinner. These mid-rise black leggings are a super soft ponte knit and thick enough that you can’t see through them, but not too heavy that you can’t wear them comfortably for most of the year. They are available in sizes from S to XL. If you dread tugging up your leggings all day at your desk, a high-waisted pair may be right for you. These leggings from Homma have a high-rise, stay-put waistband that not only keeps them in place but also contours your curves for a slimming effect. After work, it’s easy to sneak in a workout as the leggings have four-way stretch thanks to their nylon and spandex make-up. You won’t need to worry about any unwanted rips or tears when you move around. Plus, the leggings are breathable, quick-drying, and moisture wicking — which are desirable features when you’re working up a sweat. Other than their functionality, these leggings also come in a color selection that’s suitable for professional environments. The opaque colors are mostly muted and neutral, great for pairing with dresses and tunics at the office. If you have a long commute or travel frequently for work, these leggings will keep you comfortable while maintaining a professional look. Even after a long day of travel and work, they’ll still look just as tailored and flattering as they did when you first put them on. These leggings are very packable, so they’re a no-brainer to put in your suitcase for a business trip. Thick and stretchy, they’re detailed with faux pockets, to give the appearance of regular pants. They’re also machine-washable, so they’re easy to care for and don’t fade after many wears and washes. And you may end up wearing and washing them a lot once you realize how comfortable and versatile they are. If you’re looking for a style that goes beyond just solid black, the Liverpool Jeans Company makes several sophisticated, professional-looking and patterned leggings, including these heather gray plaid ones. Made from a beautiful, soft ponte knit, these slimming pants are perfect for the office as well as a night out. They feature faux front pockets and functional back pockets, giving them the appearance of regular pants. Comfortable and easy to care for, these leggings will quickly become a staple in both your work and weekend wardrobes. If you often have trouble finding comfortable, work-appropriate leggings that don’t bunch at the bottom or get baggy at the knees, these stretch twill leggings from Michael Kors are perfect for petite sizes. Soft and comfortable, these versatile pants mimic your favorite black skinny jeans and can easily be worn to the office with a long sweater or dress and a great pair of boots. The Michael Kors hardware on the front and back gives them a stylish, high-end feel. You’ll pay a bit more for these leggings, but it’s worth the money for a pair of classic, high-quality pants that offer a perfect fit and will give you years of wear. A pair of black leggings may be a closet staple that goes with everything, but a little color never hurt anyone. Bold leggings can add a fun pop of personality to your closet and complement your black tops and office-appropriate dresses. Leggings Depot offers over 40 different pastel, neon, and neutral shades, so you’re set no matter what kind of outfit you have in mind. The colors are opaque, giving your legs good coverage whether you’re wearing the leggings by themselves or under a long, flowy top. The leggings start at $9, so it’s reasonable to buy a few for work and personal use without going over budget. As for the quality of the leggings, they’re soft and stretchy, made from a polyester and spandex material. They also come with a one-inch thick, sag-resistant waistband so that you can rest easy knowing that they’ll stay up all day.